This is a simply delightful little novel set mainly on the island of Guernsey, the British island once occupied by the Nazis. The date is l946. The book takes the form of letters written to and from a London journalist, Juliet Ashton. A resident of Guernsey had come across Juliet’s name on the flyleaf of a book she had once owned, by Charles Lamb. Juliet helps him find more writing by Lamb and this leads to the discovery of an unusual book club founded on Guernsey as an alibi to protect its members from arrest by the Germans. 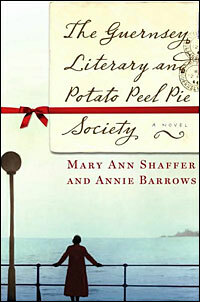 It is called the Guernsey Literary and Potato Peel Pie Society. write about. The Guernsey connection develops great appeal and she goes over to the island. She continues her letters to her publisher and friends in London and what she discovers is a delightful group of people on the island of Guernsey who survived desperate conditions during the war, with great courage and humour. She is drawn into this society and the story takes a convincing and romantic turn. It’s a charming read. The author is Mary Ann Shaffer, an American editor who had flown to England to do research on another book when she became intrigued by the story of the German Occupation of the Channel Islands. She was helped by her niece, Annie Burrows, an author herself.